A Middle Island nursery that Brookhaven Town officials have accused of illegal mulching must get rid of tires, concrete, wood and other debris stored at the site as part of a legal settlement announced Thursday by town officials. The Swezey Farm Nursery on Swezey Drive agreed to close its composting operation and submit to town inspections “at any time,” Brookhaven Supervisor Edward P. Romaine said Thursday in a telephone interview. The nursery was the scene of a December 2013 fire that officials said had threatened nearby homes. Neighbors have complained that dust, noise and odors from the nursery left them unable to open windows or enjoy lounging in their yards. The farm will be allowed to remain open as a nursery, but it will not be allowed to accept large quantities of grass clippings and other debris from trash haulers, town officials said. 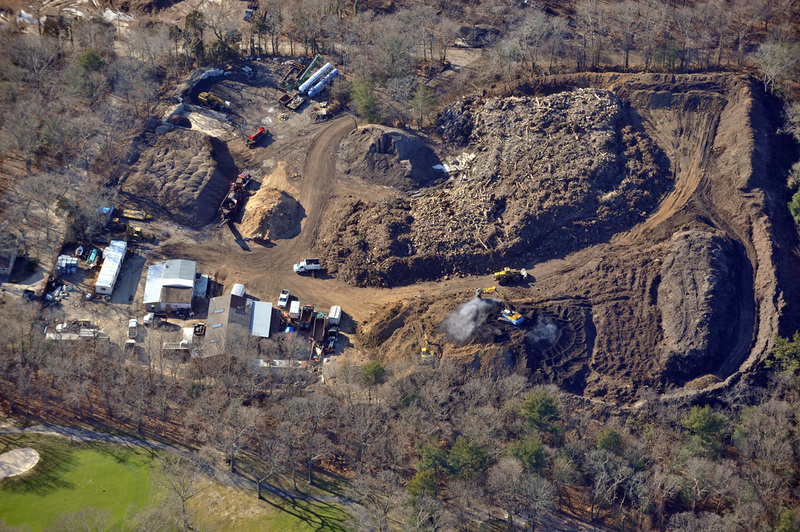 The nursery may keep up to 3,000 cubic yards of material for sale or for compost at the farm. Town and farm officials agreed to the settlement on Wednesday in State Supreme Court in Riverhead. Nursery owner Marien Marcario declined to comment. Her attorney, Alan D. Singer, did not answer a call to his White Plains office. Gail Lynch-Bailey, president of the Middle Island Civic Association, said she was pleased with the settlement because it will allow town inspectors to go onto the property. Previously, nursery officials had refused to allow inspections. Lynch-Bailey said residents stay indoors with their windows closed in the summer because of the stench from the farm. Town Councilman Michael Loguercio, who represents Middle Island, said the settlement was a “win-win” that allows the farm to remain open while improving the quality of life for residents. “No one should have to deal with the dirt and the dust and the smell that these people have put up with,” he said. Town officials raided the farm in August 2013 and alleged that the compost business was operating without permits. The town sued the farm two years ago in State Supreme Court. Romaine said town officials agreed to the settlement because it may have been two years before the suit went to trial. “We thought if we could come to the settlement, we could get relief for the residents sooner rather than later,” he said. He added town officials support proposed state legislation that may make it easier for state and local officials to crack down on suspected illegal mulching. We finally have a court date! The trial is set for Monday, April 25, 2016 in Supreme Court in Riverhead. We await the interpretation of the new 360 Regulations by NY State, which are supposed to allow for the supervision of mulching facilities by the DEC. Governor Cuomo vetoed the legislation aimed at this in favor of these regulations. Another year has gone by and we are STILL waiting for the TOB’s Supreme Court case to commence in order to Stop the MulchMare. Residents continue to suffer the ill effects of the illegal and unregulated facility at 132 Swezey Drive South. The stench, noise, air and water pollution are constant, year-round threats to their health and safety. And then there is the threat of fire — still no water main or hydrant on site. Owner-operators instead skirted this issue with a hydrant permit from the SCWA, and began regularly filling massive water tankers with “free” water from local hydrants. MICA and residents notified the SCWA — who, to their credit, rescinded the ill-gotten hydrant permit. The MulchMutts then installed an unpermitted fence along the property line, knocking down numerous trees without a tree-clearing permit. Their unmitigated gall knows no bounds. And still the trucks come and go, dumping thousands of pounds of who-knows-what, adding to the 40 foot tall mountains of madness. We urge Governor to sign this legislation into law. These people are NOT farmers — they’re PROFITEERS! 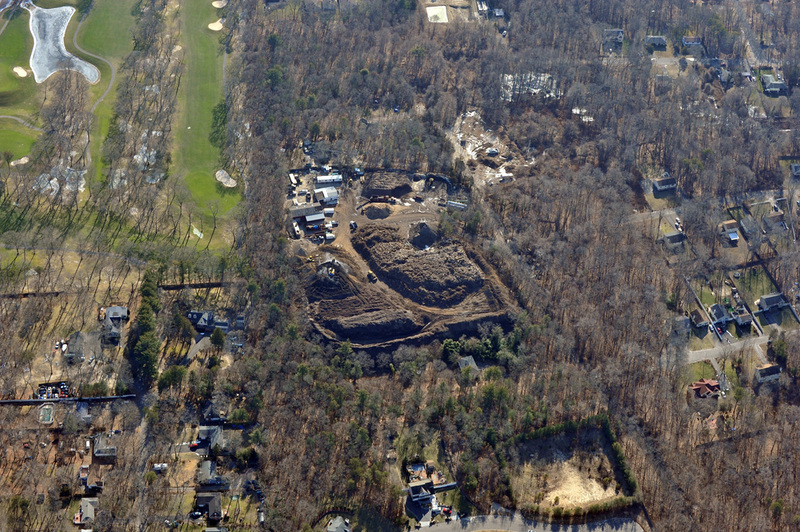 These recent aerials reveal the massive amounts of stenchful, smouldering debris on the residentially-zoned site at 132 Swezey Drive South in Middle Island. Clearly the photos depict the facility’s dangerously close proximity to long-standing private single-family homes to the north, west and east, as well as to the Strathmore at Spring Lake complex to the south. Remember, this MulchMare did not exist prior to Hurricane Sandy. Imagine weathering that storm only to have this nightmare pop up in your backyard! Residents of Park Lane, Brian Court and elsewhere live in constant fear of fire and disease. They cannot use their yards, open their windows or enjoy any quality of life. For more than two years, their homes have been invaded by pervasive dust, obnoxious smells and head-pounding noise. Most believe their property values are decimated. They’re probably right. Eight affidavits will be submitted in support of the Town of Brookhaven’s effort to close the illegal mulch facility at 132 Swezey Drive South in Middle Island. These will be filed by our attorney, Jennifer Juengst, in SC Supreme Court in Riverhead. We ask that Judge Arthur Pitts review the “mountain” of evidence about these polluters and provide deserving protection to the taxpaying, law-abiding residents of our community. Given the horrors of the Datre scandal, numerous residents wonder why anyone would allow tons of debris to be dumped, unchecked and unregulated, at an unpermitted site. Children don’t just PLAY nearby — they LIVE nearby! We are at the mercy of the courts: PLEASE HELP US!!! The unmitigated gall of the soul-less owners/operators of the illegal MulchMare at 132 Swezey Drive is now obvious for all to see along MCR. They installed this illegal sign even after the Town of Brookhaven issued a Stop Work Order to them on Tuesday December 29th. They have no permit for the sign, just as they have no permit for their mulch mountain which continues to grow and destroy the quality of life for nearby residents. This is NOT a farm or a nursery! Shame on Green Vision, the Marcario and Diggins families, Island Wide Masonry (builders of the illegal sign) and ALL landscapers who continue to dump there. MICA contines to press for action against the illegal mulch operation at 132 Swezey Drive South. 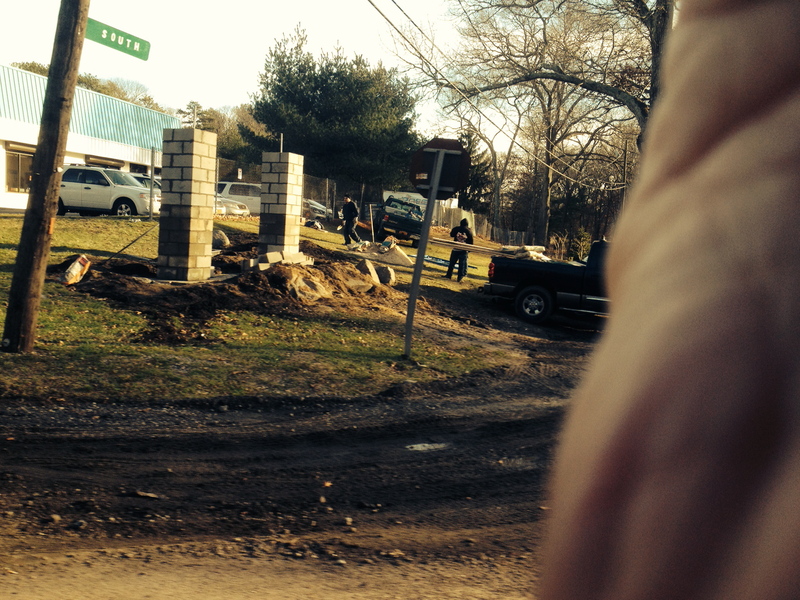 When residents noticed a sign footing being constructed at the entrance to the “private” unpaved roadway frequented by all those debris laden landscapers’ trucks, we notified the Town of Brookhaven. A law investigator and a building inspector visited the site on Tuesday, December 29th. A Stop Work Order was issued and summons written for fines and court appearances. 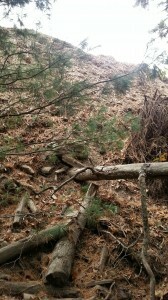 Below are two recent photos of the MulchMare Mountain looming over MI residents’ backyards. These photos were taken just before Thanksgiving 2014, and the mountain did not take the holiday off. 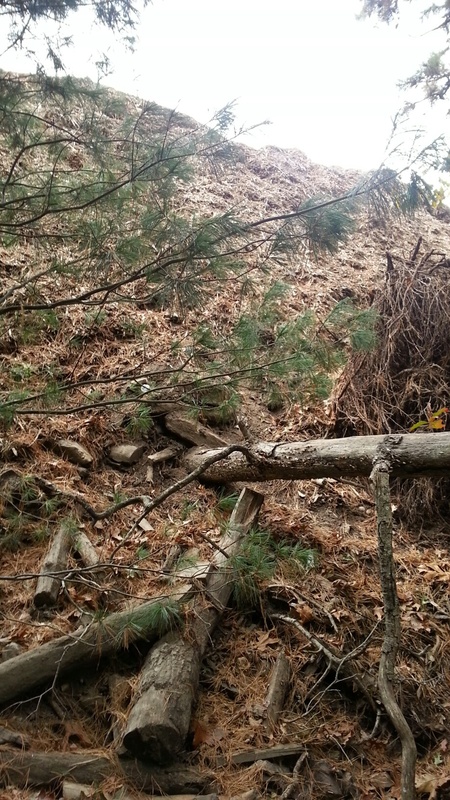 Remember, this pile did not exist until two years ago, when it erupted out of flat terrain after Hurricane Sandy.Despite the Town of Brookhaven’s unwavering opinion that this property is not zoned for use as a mulching facility, plus a well-publicized raid of the site in August of 2013, and then two subsequent fires, the place has been running at full-tilt nearly seven days a week, from sunrise to sunset. The stench, noise, air pollution and potential water contamination have made outdoor living impossible for everyone in the vicinity, and indoor living is often not much better.It’s now a full year since MICA and residents began attending the TOB’s District Court proceedings against the illegal operation at 132 S Swezey Drive. We know that local proceedings were dropped in favor of higher court pursuits, but we strongly recommend that TOB recommence enforcement at the local level come January 1, when a new District Court Judge is assigned. Otherwise these transgressors remain free to proceed without any penalty, all while destroying the quality of life for hundreds of law-abiding, taxpaying and voting homeowners.The higher court pursuits have been enormously frustrating for all, with only a very short stay granted once in Riverhead, and subsequent disappointing lifting of that stay and denial of all others pursued. We suggest that video affidavits be filed, using a local homeowners’ backyard as the filming site, with MulchMare Mountain clearly in view in the background.We note, with bewilderment, some new activity on the perimeter of the property: new landscaping at the entrance to the “private” road of Swezey Drive, land surveying activity along the borders with claims being hurled at residents that their fences are illegally positioned on MulchMare property, and the removal of the identifying street sign — all are a combination of putting lipstick on a pig, residential intimidation and making the place hard to find for novice enforcers. Earlier this year, much was made about the installation of a water main for safety– the single garden hose was clearly insufficient for eleven acres!– yet we have never received confirmation that this was accomplished.Perhaps most distressing, trucks bearing the logos of highly regarded landscaping companies (some of whom may well do business with the Town of Brookhaven) are regularly seen entering and leaving the property. It’s enormously disappointing to see a truck from Kelly Brothers — who have done so much good work elsewhere — pulling out of that dusty driveway onto Middle Country Road. Perhaps a few phone calls from town officials might get them to stop.Local residents have grown quite despondent. Some have said they welcome public officials and the media to view the MulchMare heights from their yards, but they are no longer willing to talk to the pressbecause they fear reprisals from the facility’s operators. Who can blame them? It’s hard to keep your game face on when your head aches, your eyes burn, your throat hurts, and you just can’t breathe any more.We have to help these people. 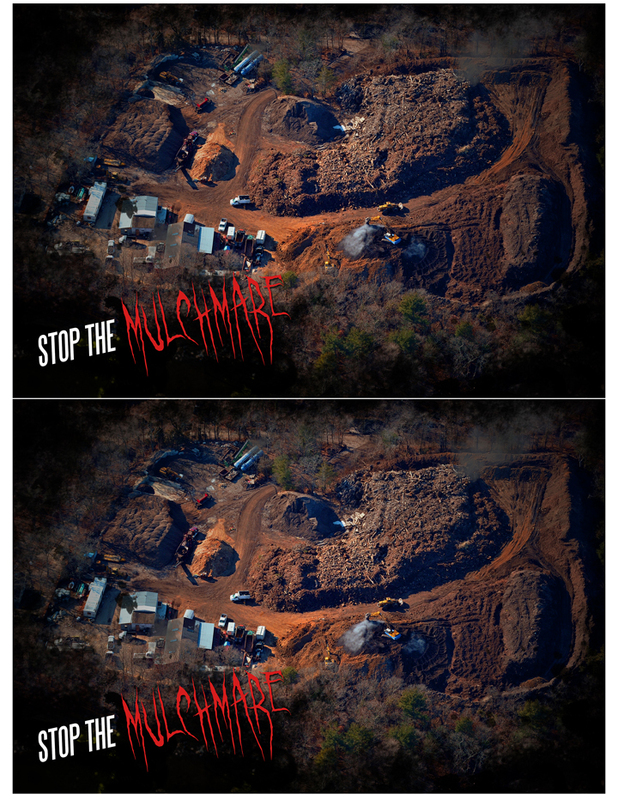 Something STINKS in Middle Island – we call it The MULCHMARE!!! Please complain to the proper authorities each and every time you are affected! In the past two years, have you seen, heard, felt and smelt the presence of a huge mulching operation in our area? 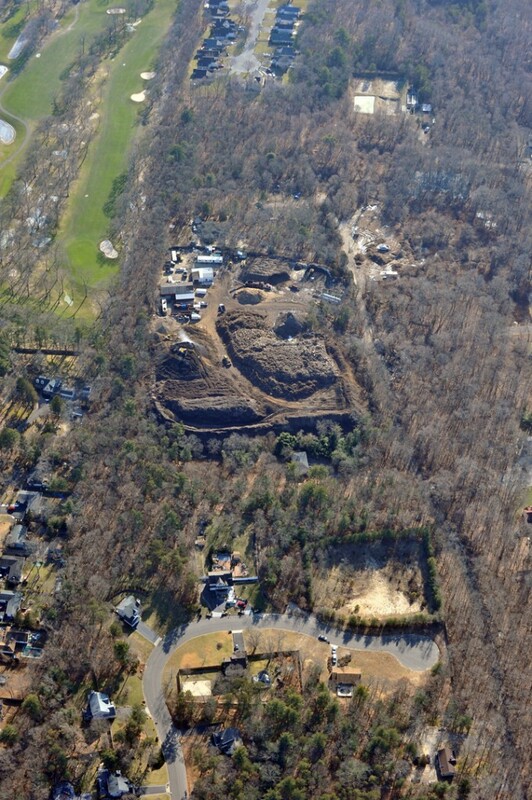 After Hurricane Sandy, the once gentile farmland at 132 Swezey Drive exploded into a near round-the-clock dumping/mulching facility. Huge piles of debris, carted in daily by dozens of dust-raising trucks, are left to ferment for profit. Massive, noisy machines move mountains of messy mulch in attempts to stop dangerous fires – two of which have already occurred. All this on land zoned A1 residential – by owners who do not live there. Meanwhile, longtime local homeowners’ quality of life and property values plummet. Two court cases are open and are being diligently pursued by the Town of Brookhaven. When local residents take a proactive stance and follow through with phone calls, emails, letters and documentation, the Town has a stronger case — and we have a chance at restored peace and sanity! Please keep a log of all actions you take and observations you make. Take photos and video when possible, and include them in your complaints. This is also your opportunity to ask the various agencies and officials your questions about the current status of this troubling operation. – For Odor Problems (stench): Call the NYS DEC odor hotline at 631-444-0380. You will be prompted on what information to leave on the recording. We have been advised to call this number EVERY SINGLE TIME you smell that odor. – For Noise Problems (loud banging and grinding of equipment): Call Town of Brookhaven Public Safety at 631-451-6162 and state this is in reference to CC#198881. They will come out and record the noise (so make sure your dog isn’t barking!) If their meter records decibels of 65 or above, they will issue a violation. Call every time things get loud at GreenVision Materials. – If you see smoke or flames: call 911. The MIFD will respond – again! –The Town of Brookhaven has retained outside counsel for the Supreme Court case. His name is Rob Calica. The brief has been submitted and a preference requested, which menas arguments should be made in November. – The offending parcel is south of Rt 25 and thus in the 7th District of the Suffolk County Legislature, represented by Robert Calarco. Reach out, express your concerns and ask questions. Please call Eva Rodriguez-Greguski at 631-854-1400 or email: eva.greguski@suffolkcountyny.gov. Especailly for Health Problems (chronic colds, asthma, reoccurring illnesses, sinus and allergy-like symptoms): SC legislators are in contact with Dr Tamarkin (Commissioner of the Suffolk County Department of Health) and it is imperative that his department knows what is going on. Call every time you or someone in your family gets sick. – Attend the monthly meetings of the Middle Island Civic Association to stay in the loop. They are held on the 3rd Thursday of the month at the Fire House on the corner of Arnold Drive & Middle Country Road. Meetings start at 7pm. On Facebook, “Like” the Middle Island Civic Association page and join the Longwood Community News Group since updates and videos are posted there. Again, we can’t stress enough that this is not a one shot deal. The more we all document the activity and register our concerns, the sooner we get back what is rightfully ours…..our quality of life.